Sometimes I love being in my kitchen and then there are times when I don’t. When I go in there and things are grimy and cluttered I just want to throw the whole kitchen in the trash and start fresh. Unfortunately that’s not possible so the only thing I can do is clean it so it can feel like my happy place again. This weekend was rainy and gloomy so I decided to give my kitchen a deep clean which ended with a fun project for the window over my sink. It all started with my Scotch-Brite® Scrubbing Dish Cloth, and a sink full of dirty dishes. 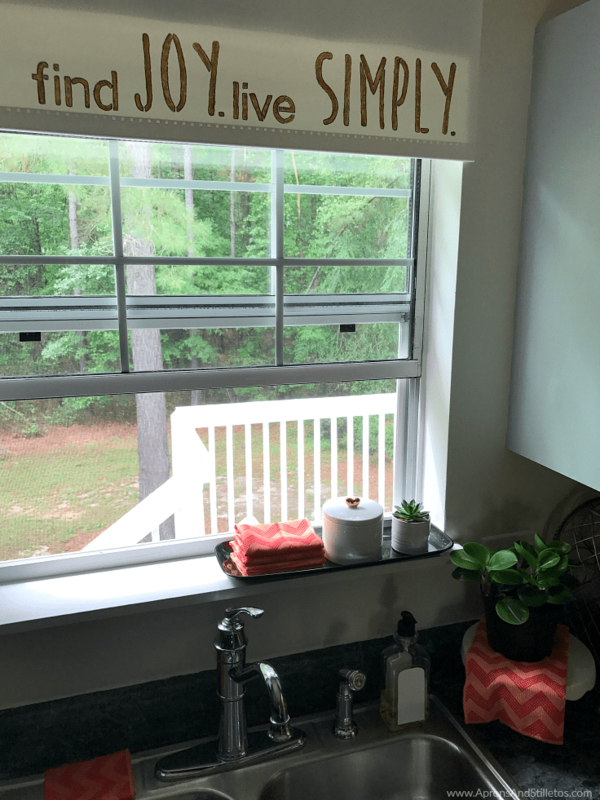 While I was washing dishes I noticed the window sill over the sink was grimy and the window needed wiping, so when the dishes and counters were clean, I tackled the window area. After washing the dishes and counters, I used the Scotch-Brite® Scrubbing Dish Cloth to wipe the window and sill. 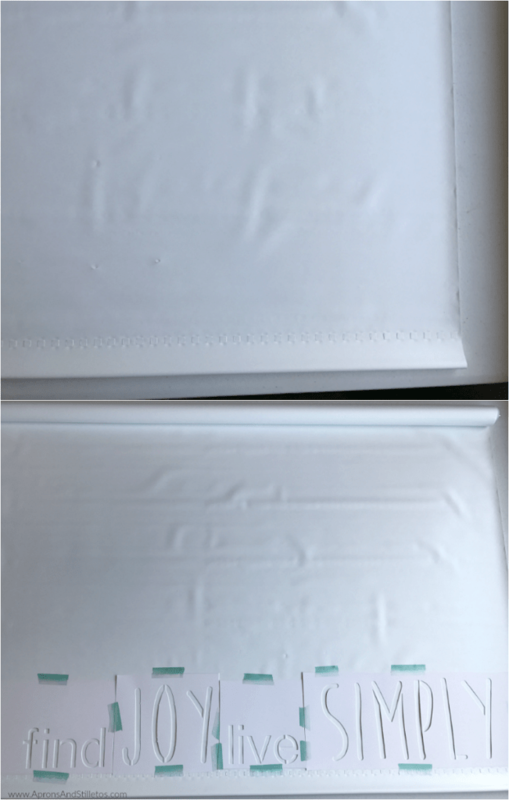 The Scotch-Brite® Scrubbing Dish Cloth has scrubbing dots on one side of the dish cloth that, scrubs but does not scratch surfaces making it great at cleaning my chrome faucet or grime on the window sill. The other side of the dish cloth is soft and perfect for washing easy dishes or windows. Once the sink area was clean, I popped the dish cloth in the dirty laundry basket and admired my handy work, but I still wasnt completely satisfied. 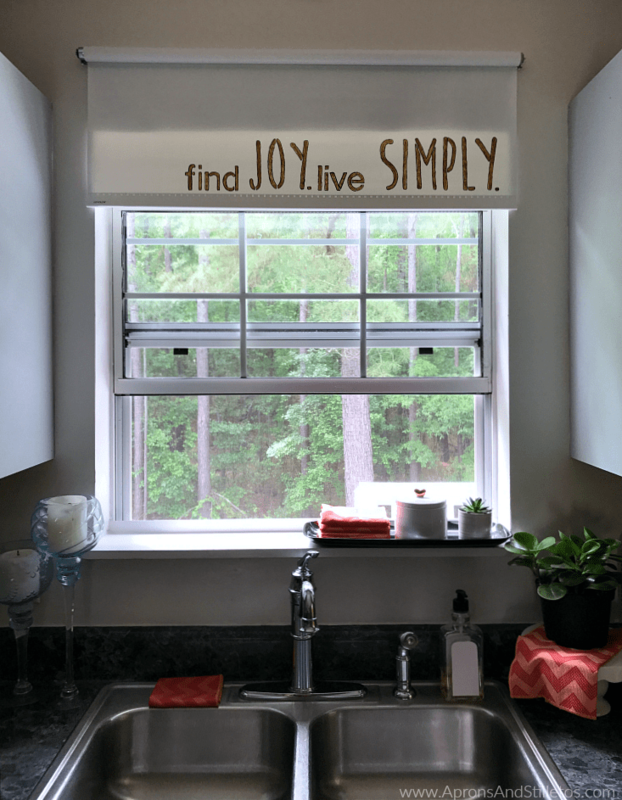 Now that the sink, sill and window were clean, the window shade looked grimy so I decided to replace it using a inexpensive vinyl roller shade. After customizing the shade and hanging it, I loved the look and feel of my updated sink area. Take a look at the tutorial and how easy it was to create. Roll out the shade to expose the area to be stenciled. Lay out and secure the stencil with tape. 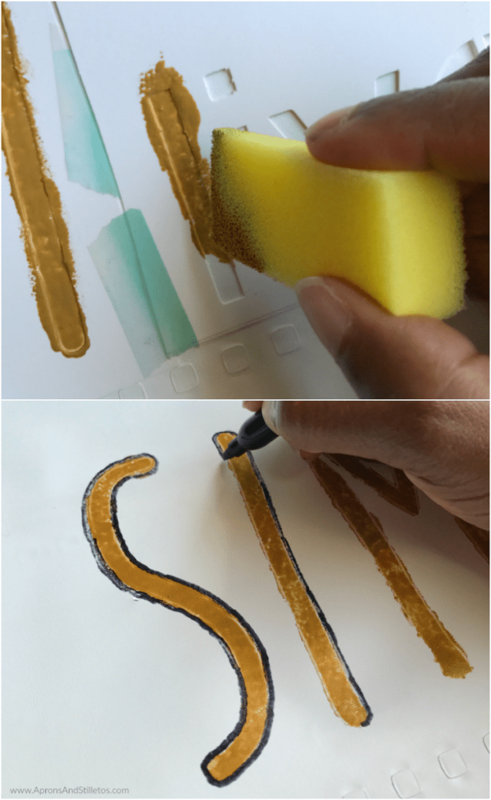 Begin dabbing the piant over the stencil using a small painting sponge. Allow the pain to dry for 5 minutes before lifting the stencil. Lift the stencil. Trace around the letters using a permenant if you experience bleeding. Allow the project to dry overnight and hang according to the instructions. Once I had my new shade hung I loved the way my kitchen skink area felt and looked. Everything was neat, clean and inviting. For this project it took me a while to choose the stencil because there were so many in the pack that I bought. I ended up combining two stencils to create this message and the words have truly been an inspiration to me. Every time I see the shade I get excited about washing dishes. Having my coral Scrubbing Dish Cloths, plants and decor around the sink pulled this whole area together for me. 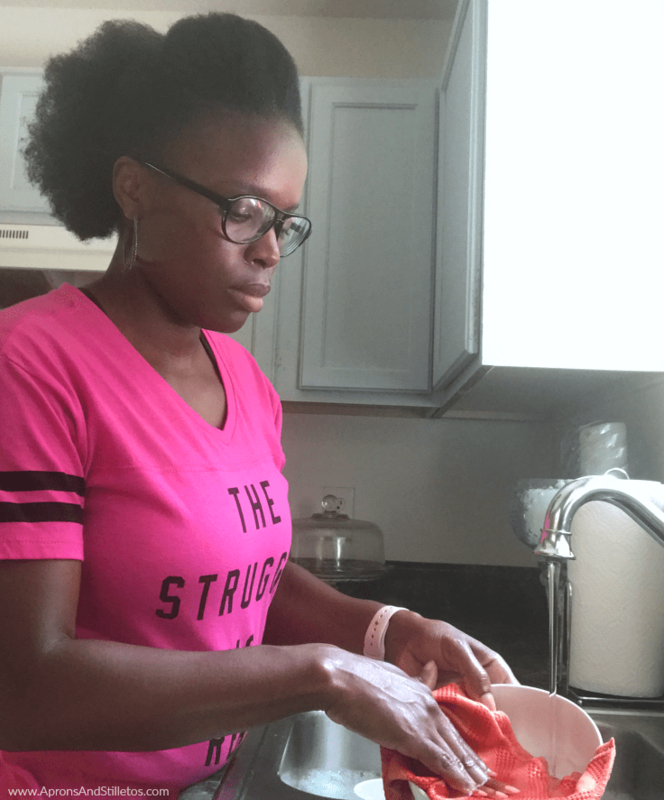 If you’re in a kitchen cleaning rut here are some tips to help you get out. 1. Change out your window treatment for this inexpensive and decorative option. 2. Bring in some plants. Living plants help clean the air by giving off oxygen. 3. Give the space a deep cleaning. Grit and grime can be a downer especially when it’s on a window that should be bringing sunlight into you home. 4. Replace you boring dish cloths with dual sided Scotch-Brite® Scrubbing Dish Cloths. 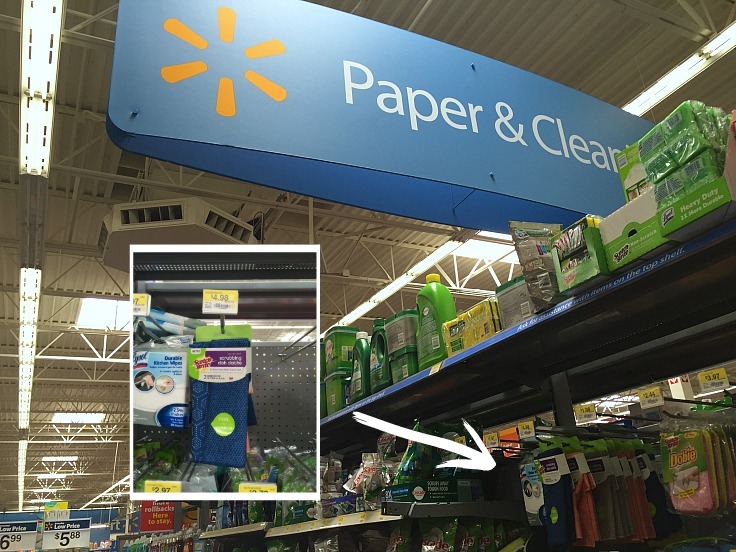 They are available at Walmart on the cleaning aisle and are sold as 2-packs for $4.97. That’s a steal and they come in the colors Tan, Navy, Gray, Mint and Coral. 5. Enter the Scotch-Brite™ Scrubstakes here for a chance to win a $20,000 kitchen makeover. All you have to do is enter your contact info and choose a team to enter. Of course you know that I’m rooting for #teamdishcloth. that's such a cute idea. i wouldn't have thought of this, very cool. I love the shade! Oh how I wish I was crafty! What a great idea! The only thing I could look at was that window over the sink. I love a window in my kitchen. The vinyl shade looks great! Love how you decorate your kitchen sink area. That certainly makes vinyl shades look much prettier! 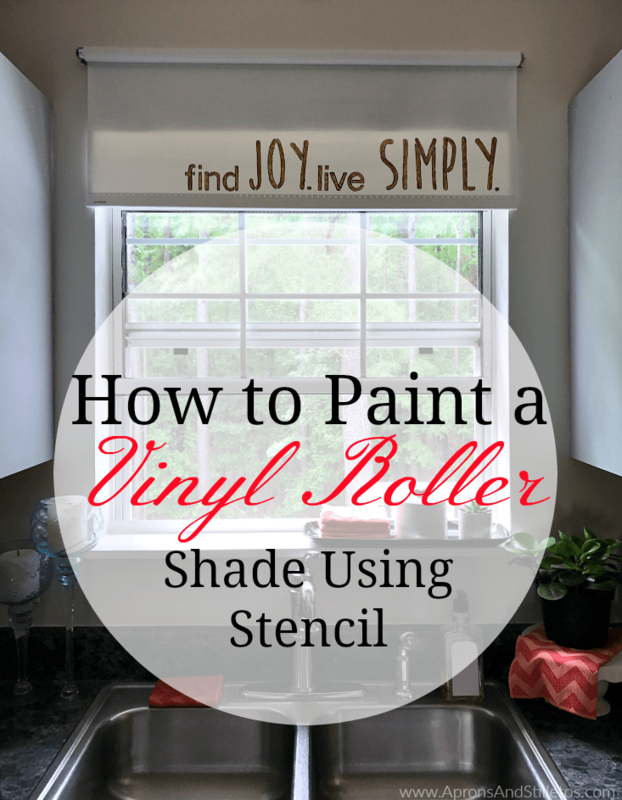 Awesome idea to do this, we don't have any vinyl shades now but I would have loved this idea back when we did! Aww, that is super cute! This worked out really well with the colors you used. Very clever idea! This is such a fun DIY idea. My parents are redecorating so I'll have to suggest this stencil idea to them!